Use commit hooks to update bugs quickly from commit log messages. That way, you can say things like "Changed X to Y, this fixes BH-123" and it will update your BugHerd bug 123 with that message, and change the state to done. Commit hooks are currently available for GitHub and Bitbucket. If you reference any valid bug number, preceded by BH- the commit message will be added to that bug. For example: "Some changes related to BH-1"
Using the word "closes" just before the bug reference, will change the state to closed. Example: "Closes BH-1"
Using the word "fixes" just before the bug reference, will change the state to done. Example: "Fixes BH-1"
Using the word "started" just before the bug reference, will change the state to doing. Example: "Started BH-1"
You can also use the exact name of the state you want the bug in instead of the phrasing above (backlog, todo, doing, done). You can reference multiple bugs at once by separating references with a comma. Example: "Fixes BH-1,2,3". You can make multiple references and phrases in the same message. Example: "Fixed BH-1,2. Started BH-3"
The bug(s) will be updated when the commit is pushed to any branch, the first time only. 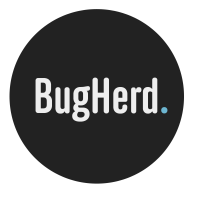 Go to the BugHerd project you wish to connect and select commit hook from the project menu. For Bitbucket, copy the web hook provided and go to Settings > Webhooks. Give your webhook a title and then paste the Bitbucket webhook URL in to the url field. Please ensure you have the Active box ticked and click Save when done.